Hotelul complet renovat, situat intr-o zona linistita, aproape de centrul statiunii Skala Potamia, dar ferit de multime si trafic, la 50 m de plaja cu nisip, este alegerea perfecta pentru o vacanta de familie. Incepand cu 01.01.2018 va fi introdusa taxa locala. In functie de clasificarea unitatii de cazare, aceasta variaza intre 0.5eur – 4eur/ camera/ noapte si se va achita de catre turisti la fata locului! Lia Studios are located in Skala Maries and only a few meters from the beach. The studios are built on a mountain. All rooms are equipped with air-condition, television, private bathroom and individual kitchen. The hotel is suitable for a quiet, calm and peaceful vacation.Distance from the Beach: ca 300mDistance from Port: ca 23km from Prinou portDistance from the nearest village/town: ca 35km to LimenasAdditional information: Cleaning: dailyLinen Change: every 3 daysTowel Change: every 3 daysBeach description: golden sandy beachesBus stop: ca 50mATM: ca 7km The images shown here serve to give a general impression of the hotel. The facilities may be slightly different from these examples as well as the names of the room types. 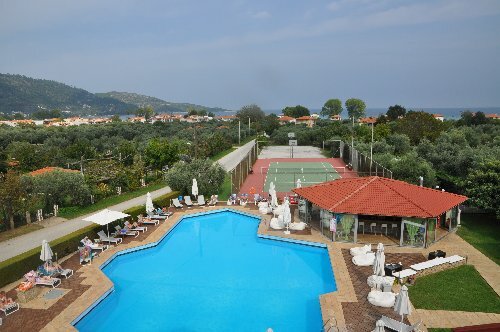 Achilion Hotel offers 32 Rooms and is located 1.5km from Skala Potamia, Thassos. Each room is equipped with a T.V., air-conditioning (hot or cold – depending on the time of year), fridge, which can be hired at a reasonable cost. visa/master credit .It is an ideal place for a peaceful and quiet holiday, accompanied with endless walks in a tranquil atmosphere.Nearby there is also an abundance of restaurants to suite your taste, whilst not forgetting to visit the hotel's pool bar, which serves all sorts of things during the day. The Hotel has a swimming pool, pool terrace with sun beds, reception, breakfast room and pool bar outside with a sitting area. Furthermore guests who have an Internet account may check their e-mail messages, from the Hotel at a small cost. The Achillion has piped music and telephones in all rooms and Satellite TV in the lounge. Fax service is also available. Distance from the Beach: ca 800mDistance from the Port: ca 13.5km from Thassos PortDistance from the nearest village/town: ca 1.5km from Skala PotamiaAdditional information: Cleaning: 6 times/weekLinen Change: 1 to 3 times during stay which depends on how many nights stay.Towel Change: 1 to 3 times during stay which depends on how many nights stay.Beach description: golden, sandy beachBus stop: ca 200mATM: ca 1km The images shown here serve to give a general impression of the hotel. The facilities may be slightly different from these examples as well as the names of the room types. 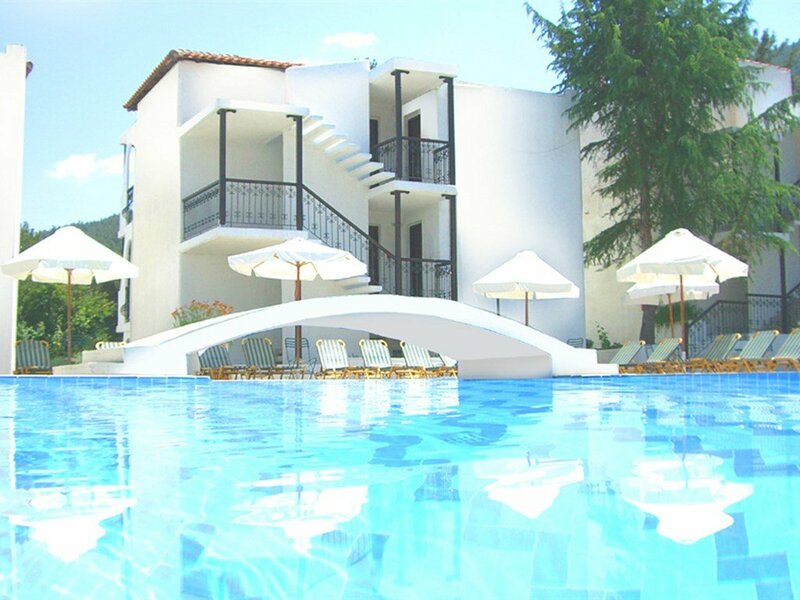 Timoleon Hotel is located in the beautiful village of Limenas in Thassos, one of the most attractive Greek islands. The fully renovated hotel with plain luxury and sophisticated, cozy and warm environment, as well as our experience in hospitality guaranty your unforgettable stay in Thassos. Harmonic alternation of colors in our hotel gives the visitor the sense of peace and internal calmness.Distance from the Beach: ca 300mDistance from the Port: ca 5mDistance from the nearest village/town: ca 8kmAdditional information: Cleaning: dailyLinen Change: every 3 daysTowel Change: every 2 daysBeach description: public, sandy with pebbles, beach bar, sunbeds and umbrellasBus stop: ca 500mATM: ca 100m The images shown here serve to give a general impression of the hotel. The facilities may be slightly different from these examples as well as the names of the room types. Hotel Philoxenia Inn is located at the city of Thassos, capital of the island, just opposite of the Archeological museum, close to the Church and the Ancient Market. It is about 100 m. distance to the market of Limenas thus it can offer to the guests an easy and quick access to the center, on foot. It is a magnificent place to rest and the reason is that it is noise-free from any kind of sound. It’s neoclassic style of architect offers luxury along with all the comforts.Distance from the Beach: ca 200m Distance from the Port: 450m from Limenas portDistance from the nearest village/town: 0km (Thassos)Additional information: Cleaning: ΤΒΑLinen Change: ΤΒΑTowel Change: ΤΒΑBeach description: sandy beachBus stop: ΤΒΑATM: ΤΒΑ The images shown here serve to give a general impression of the hotel. The facilities may be slightly different from these examples as well as the names of the room types. Costruit într-o locaţie magnifică, hotelul a fost special creat pentru a oferi oaspeţilor săi confort şi o vacanţă de neuitat. Iovi Apartments and Studios are situated in a quiet area just 500 meters from Golden Beach, in a land of 3.000 m² next to the ring road of Thassos. Iovi was designed and built in a traditional way to make guests’ stay comfortable and relaxing during summer holidays. There is a garden, full of roses and other seasonal flowers, ideal for families and children as the playground is full of different games. There is a BBQ with a dining area underneath the kiosk shade.Distance from the Beach: ca 500m (Golden Beach)Distance from the Port: ca 26km (Limenas Thasos)Distance from the nearest village/town: ca 500m (Skala Potamias)Additional information: Cleaning: TBALinen Change: every 4 daysTowel Change: twice a weekBeach description: sandy beachBus stop: ca 80mATM: ca 150mThe images shown here serve to give a general impression of the hotel. The facilities may be slightly different from these examples as well as the names of the room types.